One of my friends who is still working full time shared with me her desire to do something besides work – something creative. I suggested classes at our El Camino Community College and the South Bay Adult School, maybe in jewelry making or to learn a new language. But she said she’d like to get into writing. I asked her if she journaled. With that she pushed herself away from the table and leaned against the back of her chair, as if she were physically moving away from that subject. After a long pause, she told me she couldn’t write down anything private for fear of it getting into the wrong hands. Of course, that’s a common fear among those of us who journal, but it hasn’t stopped me. When I first started journaling regularly back in 1993, I wrote in notebooks—the finer the better. I especially loved the ones I bought in France and later found at Banner Stationer’s in El Segundo, CA. The pages are very thick and slick and don’t show through to the backside when written on in ink. Also, the covers are in beautiful jewel-tones. I always felt as if I were writing in a very special place when I wrote in those notebooks. However, a few years ago—after being so careful to clutch my notebooks close to my chest any time I was out and about—I left one in the seat pocket on the flight home. I went to the airline’s lost and found, but alas, I didn’t get the notebook back. Luckily, it was a fairly new notebook, so I didn’t lose too much. And as a result of that loss, I use my notebooks for workshop notes and write my journal entries on my computer. Of course, that doesn’t guarantee privacy, either. I managed to have a laptop ripped off at another airport a while ago with all my stuff, including my journal entries, on it. However, when I first started journaling on my computer, I created a separate, password-protected folder for my journal documents. I picked a password that was meaningful only to me, and I know for sure that the only way I’ll ever forget it is if I lose all my marbles—probably not very likely. I told my friend that story as I tried to convince her to start her journal writing. (By now she was leaning toward me.) “Start writing about fifteen minutes a day,” I said, and she seemed interested. I’ve been journaling the first thing every morning for over twenty-five years and have never felt violated. Also, I’ve found it to be a good way to kick-start any kind of writing piece. My memoir, Leaving the Hall Light On, began with journal entries. I never gave up on my dream. That is the key. All it took was the persistence to never give up. Early on in my life I thought of myself as a journalist and creative writer, but after college I settled for something more practical–technical writing and editing in the aerospace industry. And while I was even able to convince myself that I would never be able to achieve my dream, it kept gnawing on me. While I worked my day job as a technical writer for over twenty-eight years and in a few other jobs as a real estate salesperson, programmer, and fundraiser for non-profits, I took creative detours. I learned to draw and paint, I learned to sew, I made needlepoint pillows, I quilted and knit. And, I co-authored a non-fiction book, Blue Collar Women: Trailblazing Women Take on Men-Only Jobs–where the writing was just a little less technical than my work in aerospace. I did anything to keep my creative juices flowing, until I could stand it no longer. I needed to reconnect with my passion to write. It finally took a tragedy in my life to help me realize my dream. When my son was diagnosed bipolar and our family was going through the emotional upheaval his illness created in all our lives, I started to journal. Writing about my son’s illness and later about his suicide death helped me put my pain on the page–the only place I could show my true feelings. Keeping my fingers moving either across the page on or the computer keyboard became my calming and healing balm. I also took writing workshops. At first I felt insecure about my creative writing abilities because they had lain dormant for so long. That changed when I took a workshop called, “Writing about Our Lives” at Esalen in Big Sur, California in the late 1990s. I wrote about my misgivings about ever being able to make the transition technical writer to creative writer: “My writing is so factual, so plain, so devoid of descriptors, feelings, and imagination.” And that was okay. When a private instructor in Los Angeles taught me to “write like you talk,” I knew I was on my way. Once I got into the writing groove I never stopped. I had a memoir published culled from my early journal entries and poems, Leaving the Hall Light On: A Mother’s Memoir about Living with Her Son’s Bipolar Disorder and Surviving His Suicide. Even finding a publisher took perseverance. Sixty-eight rejection letters later I found the perfect small press to publish my book. And now, I still write something every day. I journal and write poetry regularly. I write for my own blog, and I am well on my way to completing my first novel. Instead of worrying about my lack of creative abilities, I took the power within me to accomplish my dream. My son’s death gave me that strength and power. For more from Madeline Sharples, visit her blog. One of the first reviewers of my memoir, Leaving the Hall Light On, said, “….The poetry and photographs add an extra dimension that is missing from most memoirs like this since as a reader you get much closer to the reality of what is being described on the page….” (Mark Shelmerdine, CEO, Jeffers Press). Another reviewer said my book is “poetically visceral.” Those statements helped validate any misgivings I had in adding other creative works into my manuscript. I really hadn’t thought of putting photos in my book until my publisher suggested it. And of course I was delighted. At first she suggested photos interspersed within the chapters, but my book didn’t lend itself to that. So I picked out photos in groups: of my son Paul – the main subject of the book, of him and his brother, family photos, views of my office, garden, and one of the memorials to Paul – a bench dedicated to him on the greenbelt outside our home. At the time I had no idea what an impact these photos would have on the message of the book. However, I am currently reading Keith Richard’s memoir, Life. It has two photo sections. And I keep going back to these photos as I get to know more about the characters in his book. Inserting my poems was another story. I never even considered leaving them out. They were instrumental in my book’s organization. I had journal entries and other writings to draw from and a poetry manuscript, and I arranged my book’s chapters according the order of the poems in my poetry manuscript. However, I still worried about what others would think. So many agents state that they don’t look at poetry. A memoir workshop instructor wasn’t keen on the idea. However, one of the people who had read my poems several years ago now says he can relate to them better because of their context in the story. The bottom line is: I was fortunate to find a publisher who not only liked the poems I initially had in the book, but asked for more. Because I collect quotes – I usually note them down when I read, and I continually post them on my Facebook author page – I decided to insert three quotes in my book– two from books and one from a song. And that turned out to be the biggest problem in finally getting my book to print. Since I felt they were integral to my story I was adamant, but it took months to get the necessary permissions. The main lesson is: if you want to include other authors’ words in your book, start getting permission early. All in all I felt it was well worth the extra time it took to include other works in my memoir. My writing is very personal and I feel the photos, poems, and quotes helped deepen the personal message of my words. My publisher advised me to revise the second half of my memoir, Leaving the Hall Light On, almost entirely when she decided to publish my book. To that end I used many of the steps I learned while working as a writer-editor-manager of proposals to the U.S. Government to revise my book. Here is my revision process. 1. Plan before doing. I created a revision plan based on notes from my publisher and advice from my first reader. Then I got my publisher’s buy-in. 2. Read before revising. Since I hadn’t looked at my draft for almost two years, I read it front to back with my revision plan in hand. I marked up a hard copy with a red pen and made no electronic changes until I was through. Wow! did I find lots of things to edit, including typos, awkward sentences, repetition, and inconsistencies. I also noted where I needed to insert new material, move things around, and update. 3. Use storyboards. 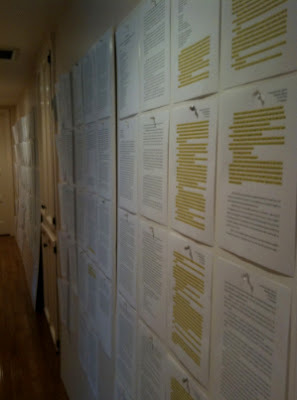 I set up foam storyboards along the hallway next to my office and pinned up a printed copy of each chapter as I electronically finished incorporating my first round of edits. Storyboarding allowed me see the book all at once and better spot redundancies, inconsistencies, places that needed cutting, moving, and expanding, and where each chapter best belonged. I highlighted problem areas in yellow so I could see text I needed to revisit again. 4. Get others to review. After I completed these edits and reworked the yellow-highlighted portions, I gave three willing writer friends an electronic copy. One person did a line-by-line edit. He also found punctuation and sentence structure problems. Another friend looked at the content for repetition, inconsistencies, and writing accuracy. And the person who originally helped me create my revision plan read it again for organization problems. She made suggestions about where to move, eliminate, or combine material. 5. Stay in control. However, I made the final decisions about whether to take my editor’s notes or not. Even my publisher, said,”… Others can only offer advice. Only you can write this book.” So I reviewed each comment and only fixed what I thought relevant. 6. Stay on schedule. Because I was reliant on other people’s inputs, I created a tight schedule. I allocated five months to complete everything, including incorporating my revisions and reviewer’s comments, merging the finished chapters into one document, gathering photos for the cover and body of the book, getting permissions to use quotes from other authors, and writing dust jacket copy. 7. Know when you’re finished. After incorporating review comments, I still felt the needed to make a few changes, add a few words, and edit a little more. Finally when I didn’t have any more changes or adds or deletes or reorganization ideas left in me, when my mind stopped living and breathing the book every waking moment of every day, and when I felt comfortable letting it go, I knew I was really finished.